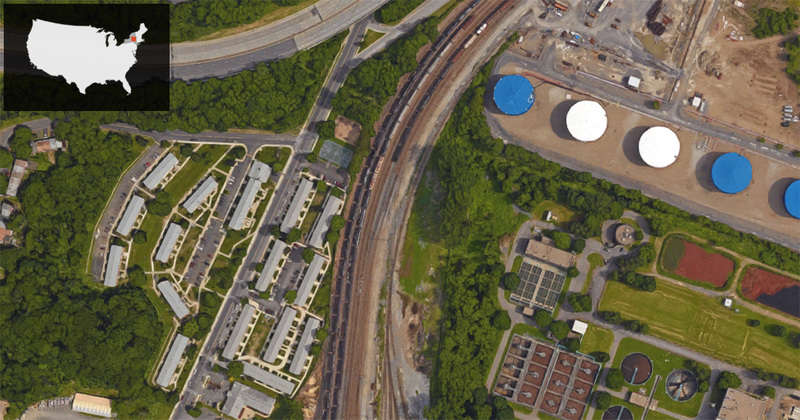 Global Companies, LLC, announced that it is abandoning the plan to modify its crude-by-rail facility in Albany, New York, to handle tar sands oil — "a huge victory for the families who live, work, and go to school in Albany's South End," said Chris Amato, staff attorney at Earthjustice. 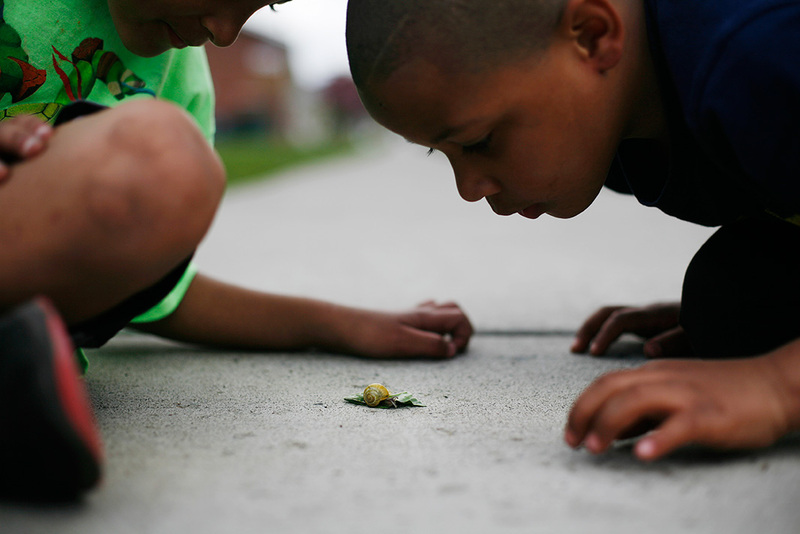 "This has been, and continues to be, a fight for environmental justice." Global's announcement came following a four and half year legal battle fought by Earthjustice on behalf of the Ezra Prentice Homes Tenants Association and several environmental organizations. Read more. When fossil fuel polluters need a place to do their dirtiest and most dangerous work, they tend to locate their operations in places where they believe people have less power, often in low-income communities or communities of color. 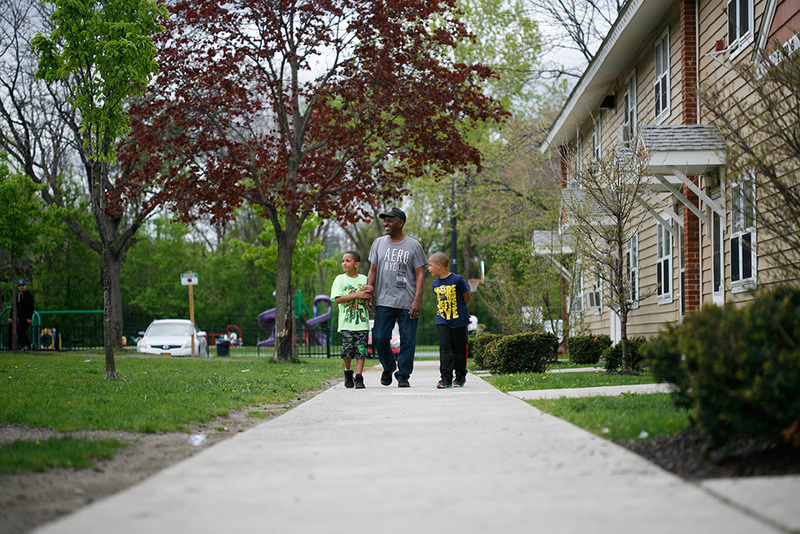 Faced with a deadly new threat, residents in one predominately African-American community are organizing their neighbors and allies from far and wide—building the power to take on a Fortune 500 company and complacent regulators. Units at the Ezra Prentice Homes on Saturday, May 7, 2016, in Albany, New York. 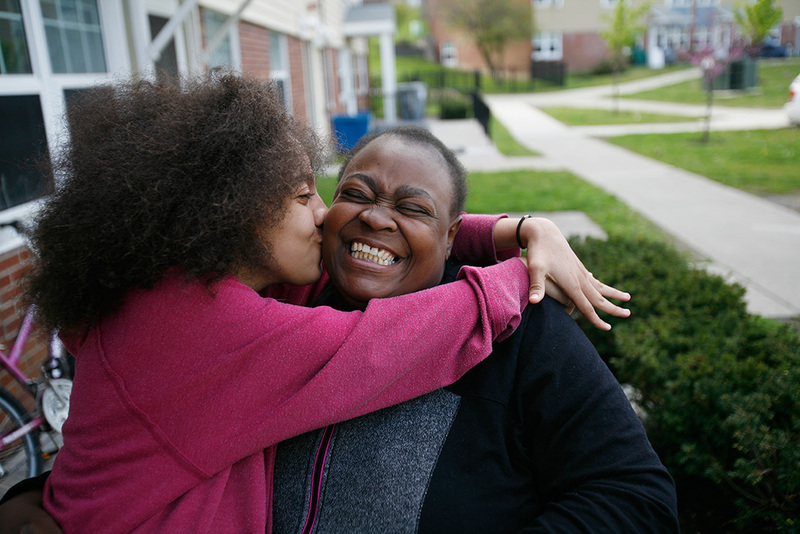 Leatha, 13 years old, gives her mom, Angela Scott, a kiss outside their home at the Ezra Prentice Homes. The Ezra Prentice Homes are located next to the railroad tracks where oil tank rail cars travel. 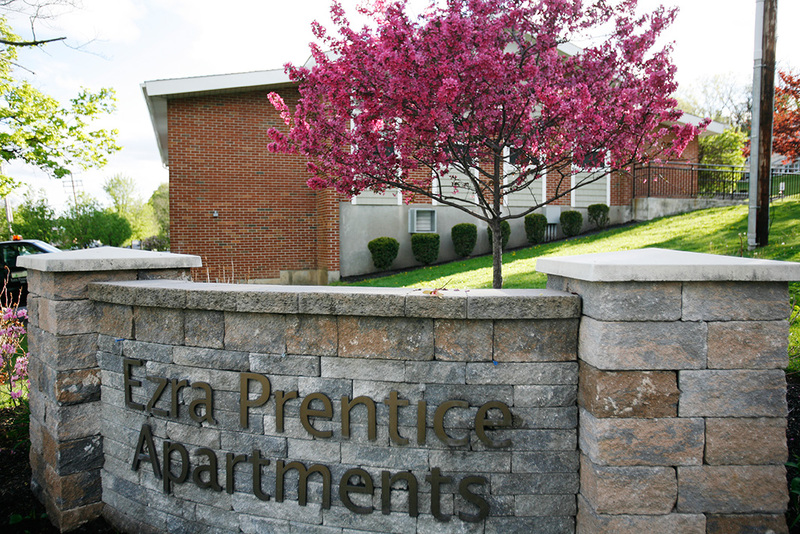 Ezra Prentice Homes, in Albany, New York, is a community where people look out for one another. Be Be White, a resident for 12 years, takes that responsibility seriously. Each morning he wakes at 5 am, helps his son Brayton into his school uniform and takes his post at the nearby crosswalk to usher Brayton and his neighbors’ children safely from one side of the busy road to the other to catch the school bus. 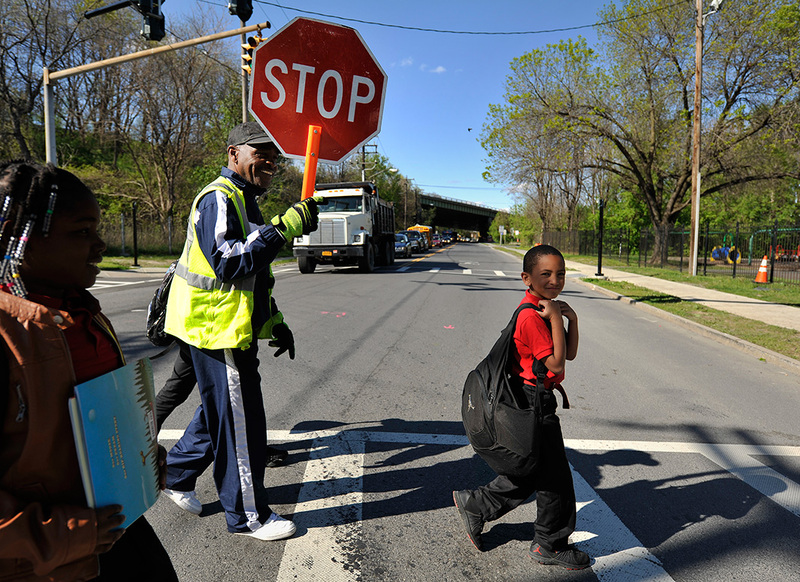 School crossing guard Be Be White stops traffic on South Pearl Street for children, including his son Brayton and Sanaiya, both six years old. As they marveled at the creature named after the friendly "Thomas the Tank Engine" character they adore, looming above them was another, decidedly less innocuous, train—the kind that hauls 1.8 billion gallons of crude oil past their home each year. 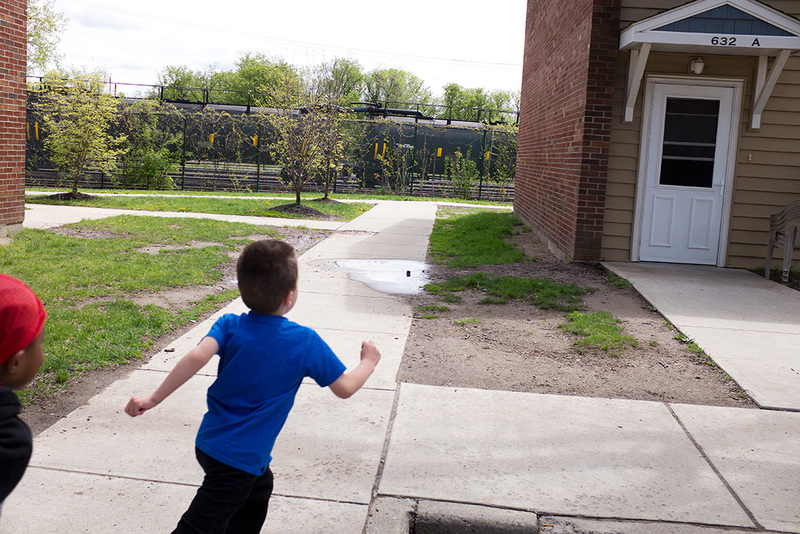 Antonio, five years old, runs through the complex with a friend, as a line of tanker cars sits feet away. 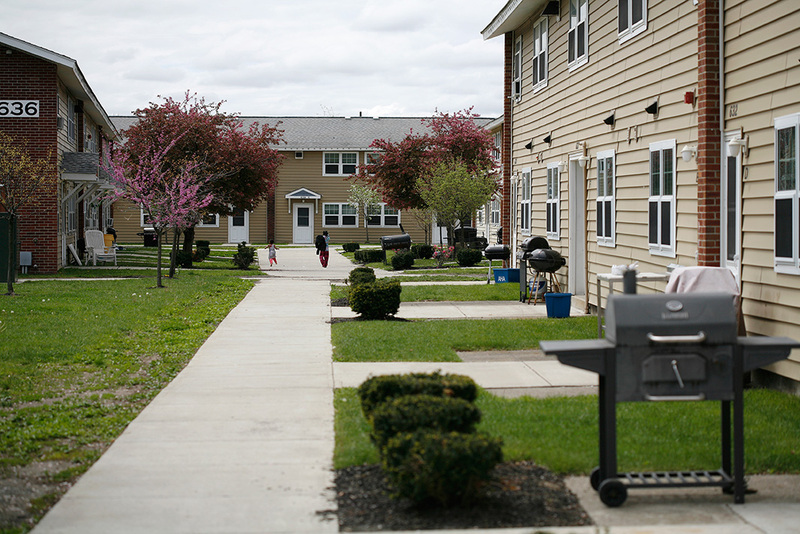 Ezra Prentice Homes, a public housing complex that is home to 179 families and 288 children, borders an industrial railyard. 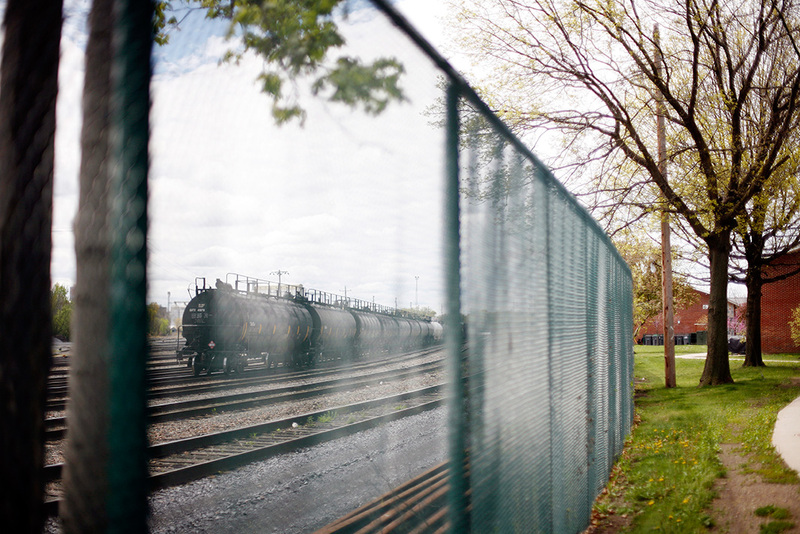 And since 2012, there has been a spike in trains carrying crude oil through the community to the railyard. The oil trains are the same type that have been derailing and exploding their cargo with unnerving frequency across the country. 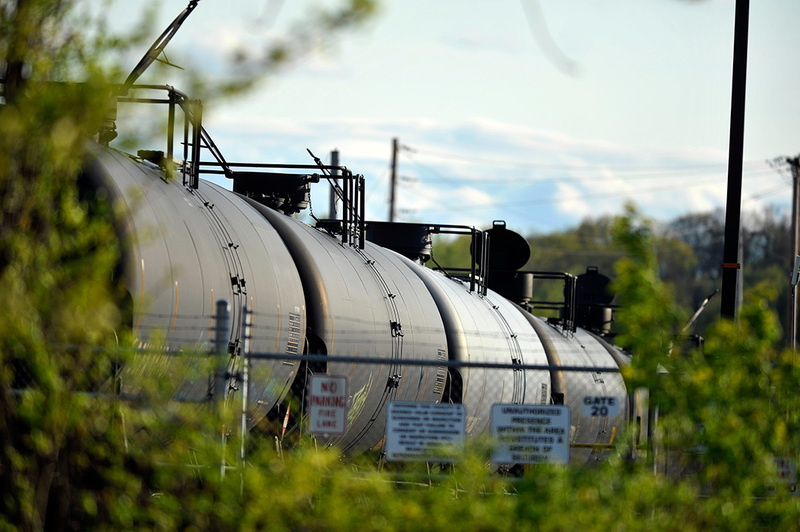 After Exxon Mobil sold the property to Global Companies LLC, New York state officials quietly approved a quadrupling of the amount of crude oil transported to the site by rail. Railroad tank cars in the Kenwood Rail Yard near the Port of Albany and Interstate 787. Be Be and his neighbors were never informed about the proposal. 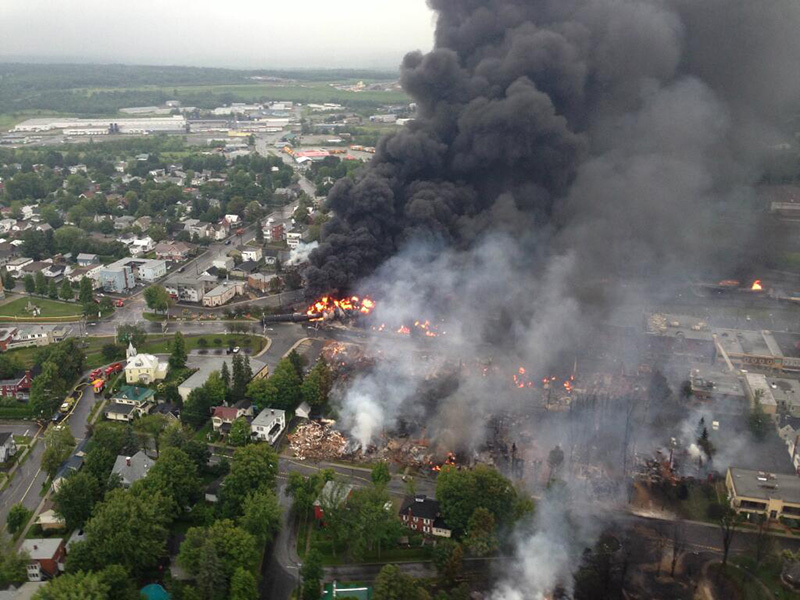 The oil train explosion in Lac-Mégantic, Canada, in 2013 killed 47 people. 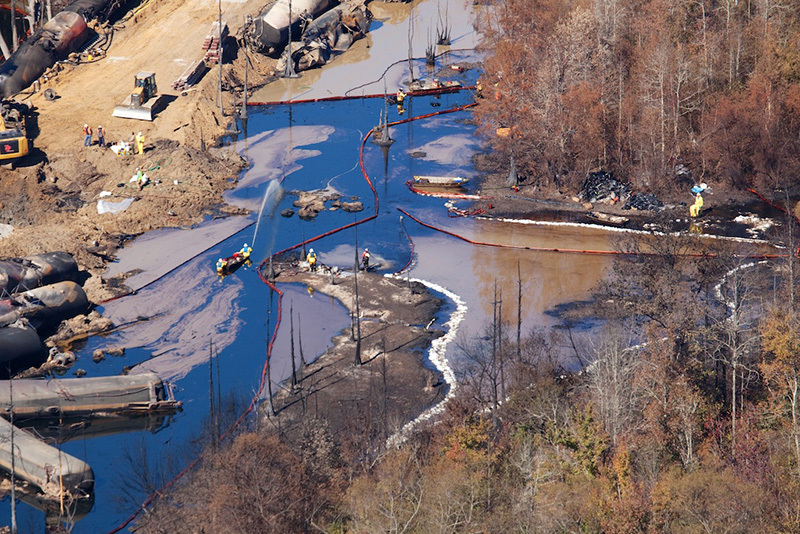 Clean-up operations after an oil train derailment near Aliceville, Alabama, in 2014. 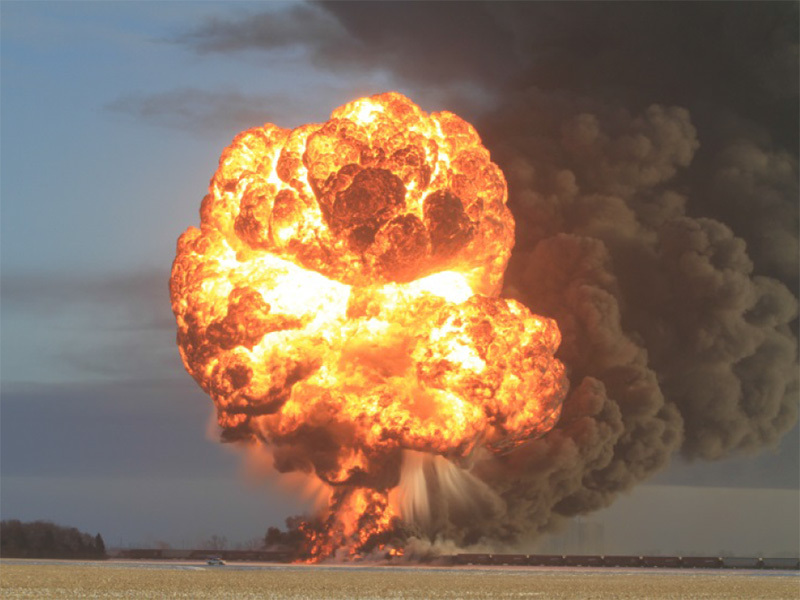 An oil train explosion in Casselton, North Dakota, in 2013. They weren’t told that the tankers, which line up just 20 feet from the community’s playground, were hauling a type of crude oil that is highly flammable and toxic. They weren’t notified that the fumes released during the tank car unloading operations at the Global facility included cancer-causing chemicals. The seemingly endless parade of tankers that began rumbling past their homes served as their official notice. More than half the residents of Ezra Prentice live within 100 feet of the railyards. And they worry if one day they might meet the same fate as those who lived in Lac-Mégantic, Quebec, where an oil train derailment and explosion killed 47 people in 2013. 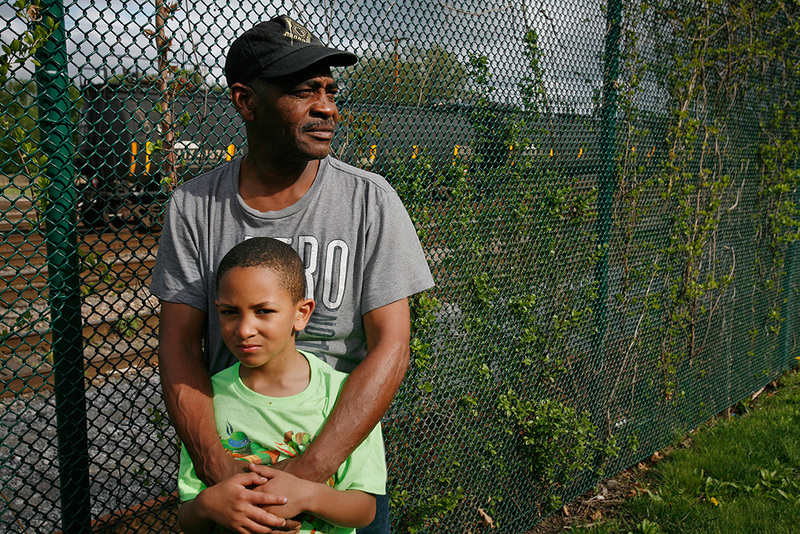 Be Be White and his son Brayton stand along the fence that separates the railroad tracks from Ezra Prentice Homes. Be Be’s not alone. Many of his neighbors carry the same fears and raised them in meetings of the Ezra Prentice Tenants Association. Led by Charlene, the Ezra Prentice Tenants Association decided to take on Global Companies LLC, the Fortune 500 company that had pushed its way into their lives, and the state officials who had let it happen. Charlene Benton, president of the Ezra Prentice Tenants Association. In May 2017, Charlene passed away after a long illness, and Be Be White stepped into the role. Storage tanks at the Global facility, and the nearby Albany County South Wastewater Treatment Plant. 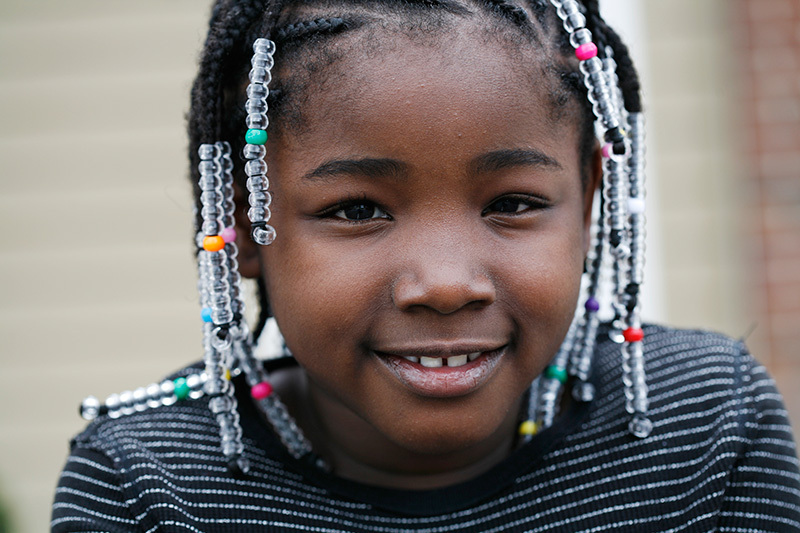 Charlene Benton and Be Be White didn’t know it at the time, but state regulators had violated their own policies by approving the expansion of crude oil shipments without consulting Ezra Prentice residents and others in Albany’s South End community. Under state policy, low-income and communities of color that have been overburdened with environmental pollution are designated as ‘environmental justice’ communities. 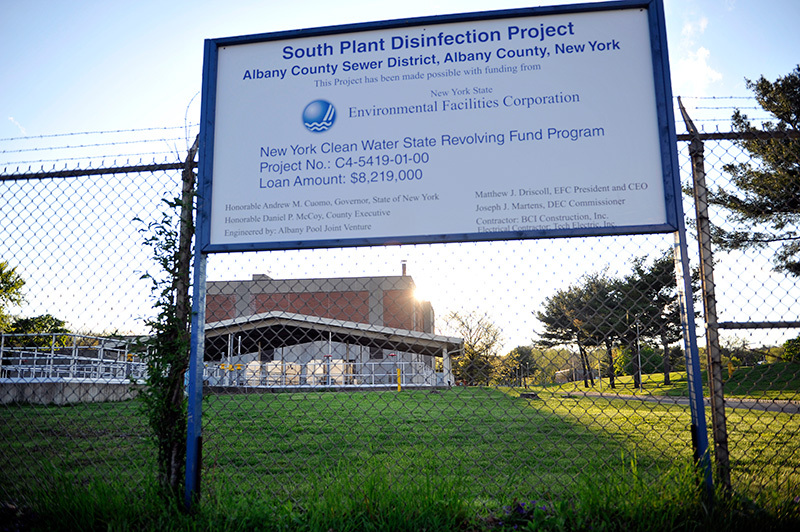 Albany’s South End—where polluters like the Port of Albany, a county sewage treatment plant, and the Global facility are all located—was declared an environmental justice community by state regulators. When Global proposed a plan to quadruple their shipments of toxic crude oil to facility, state officials were required to inform the community and provide them with any information concerning Global’s expansion. They did neither. Ezra Prentice Homes is the complex of grey-roofed buildings bordering the left side of the train tracks—where a line of tanker cars can be seen lined up. Global's facility and storage tanks are on the opposite side of the rail tracks. 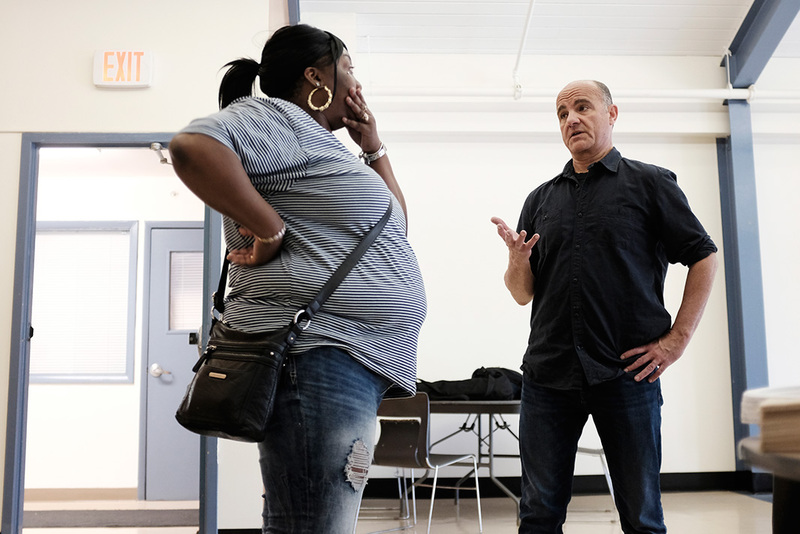 Lakisha Thompson speaks with Earthjustice attorney Chris Amato in the community room at Ezra Prentice Homes. Thompson's young cousins live at the apartments. Upstate New York is home to one of the country’s most impassioned anti-fracking movements. When the groups who’d fought to ban fracking in New York—including Earthjustice, Riverkeeper and Sierra Club Atlantic Chapter—learned their state was becoming a transport hub for fracked oil, they allied with Ezra Prentice residents in the fight. In 2013, Earthjustice Staff Attorney Chris Amato, while poring through state records of environmental permit applications, noticed that yet another expansion was planned at the Global facility. Global executives were training their sights beyond North Dakota, to the tar sand oils of Alberta, Canada. 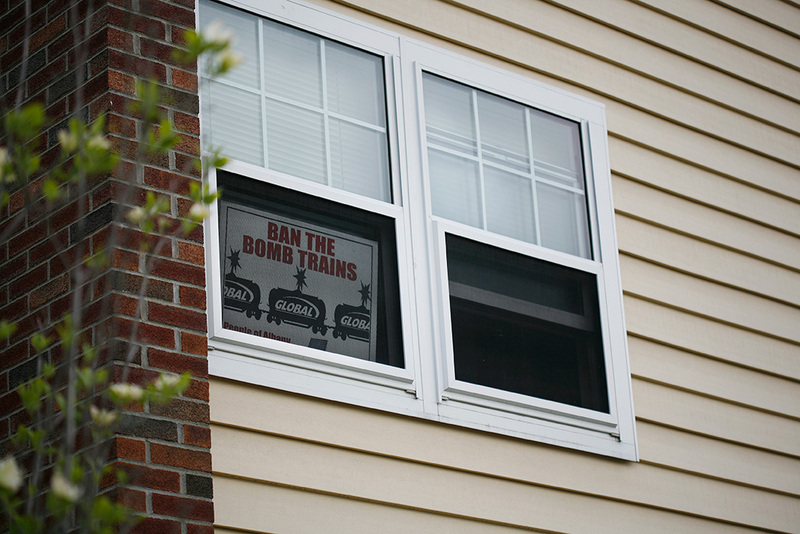 Global wanted to ship the tar sands by rail to Albany. It applied for a permit to heat the thick, gooey crude in railcars so that the oil could be loaded onto Hudson River barges and sent to refineries along the Eastern seaboard. 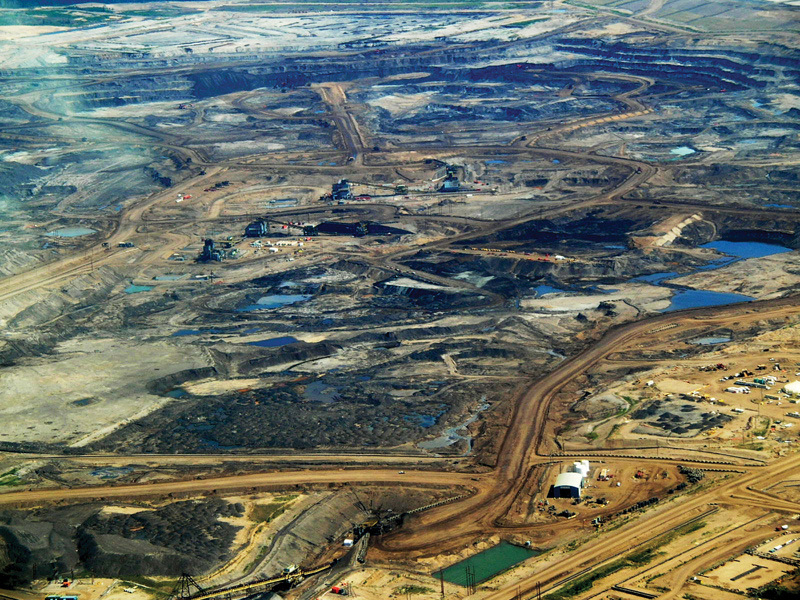 A tar sands operation in Alberta, Canada. Tar sands oil, made infamous during the battle against the Keystone XL pipeline, is one of the dirtiest fossil fuels on earth. At each step in the process—from drilling to shipping to processing to burning—the air, water, and climate pollution is devastating. The crude also contains high levels of benzene—a known carcinogen. 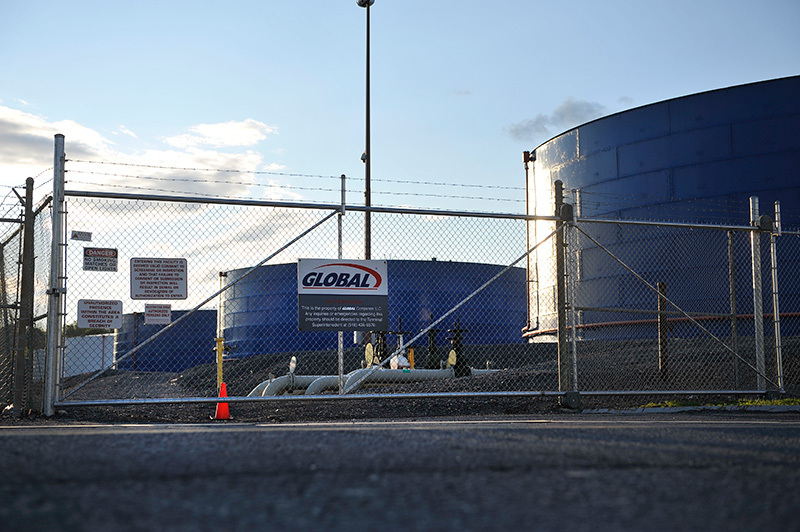 Global’s plan to cook tar sands oil on site, in tankers and storage tanks at its Albany facility, threatened to expose Ezra Prentice residents to even more toxic air pollution. This new planned expansion would not go through without a fight. A sign in one of the windows at Ezra Prentice Homes. Chris Amato met with tenants association President Charlene Benton, Be Be White and other community members. State officials had, again, ignored their environmental justice policy and failed to inform the community of Global’s tar sands application. The state also claimed the tar sands proposal would have no impact on the surrounding community—the same conclusion they’d drawn about the quadrupling of rail traffic. It looked a lot like the environmental racism the state’s environmental justice policies were designed to prevent. Attorney Chris Amato, at the Ezra Prentice Homes community room. Chris is a staff attorney in Earthjustice’s New York office and an Albany resident. 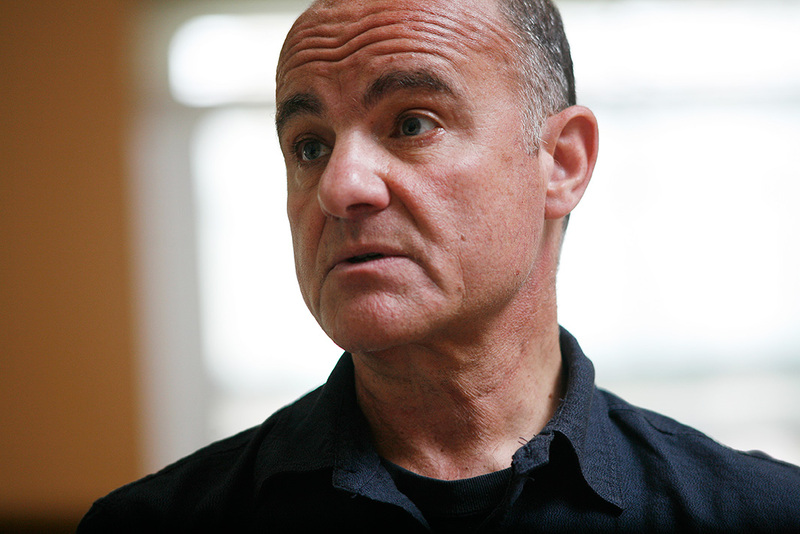 In June 2014, Chris filed a state court lawsuit against Global and the state on behalf of the Ezra Prentice Tenants Association, along with Riverkeeper, Sierra Club Atlantic Chapter, the Center for Biological Diversity and the Waterkeeper Alliance challenging Global’s proposal to handle tar sands at the Albany facility. And in January, he filed a separate lawsuit in federal court challenging the illegal 2012 expansion of crude oil shipments at the Global facility. To date, this coalition has managed to keep the tar sands proposal at bay, winning a key victory in court in July 2016 that kept the project from being fast-tracked for approval. Promising steps. But state officials had still failed to protect residents. Railroad tanker cars, on the track adjacent to Ezra Prentice Homes on Saturday, May 7, 2016. In the years since Charlene Benton and Be Be White began mobilizing their community to demand accountability from state officials, a worldwide mobilization was also taking place. Climate activists are pushing national and international leaders to speed our transition from fossil fuels to 100 percent renewable energy. And, from the Paris climate treaty to state-level community solar pilot projects, they are gaining ground. The fossil fuel industry is resisting, bent on maximizing short-term profits. Global has made no secret of its desire to make the Port of Albany the largest oil transport hub on the East Coast. When national opposition stopped the Keystone XL pipeline, Global had even greater incentive to bring tar sands oil into Albany by rail. But the same forces that defeated Keystone XL are now taking on dangerous fossil fuel infrastructure projects, such as the Global facility expansion, and organizing solidarity protests and demonstrations. Be Be White, with his son Brayton (left) and Jahcere, walk through the Ezra Prentice complex. Sanaiya at Ezra Prentice Homes. She often visits her grandmother who lives there. Antonio, outside his home at Ezra Prentice. The state and federal lawsuits are now making their way through the court system. If the litigation is successful, it could force state regulators to complete a full environmental and public health review of the tar sands oil proposal or push them to reject the proposal altogether. Just as Be Be takes seriously his responsibility of looking out for the children in his community, our leaders must take their responsibilities seriously—to communities bearing the brunt of fossil fuel industry pollution and to future generations facing the threat of catastrophic climate change. And when our leaders delay and equivocate between protecting people and protecting profits, we all have a role to play in pushing them to choose wisely. In Memoriam: On May 9, 2017, Ezra Prentice Tenants Association President Charlene Benton passed away after a long illness. Her dedication to her community was celebrated during a memorial service on May 24, 2017. "Charlene was unfailingly courteous, but unflinching in her determination to stop Global from polluting her neighborhood," wrote Earthjustice attorney Chris Amato, who worked closely with Charlene for many years, in a remembrance and appreciation of Charlene. 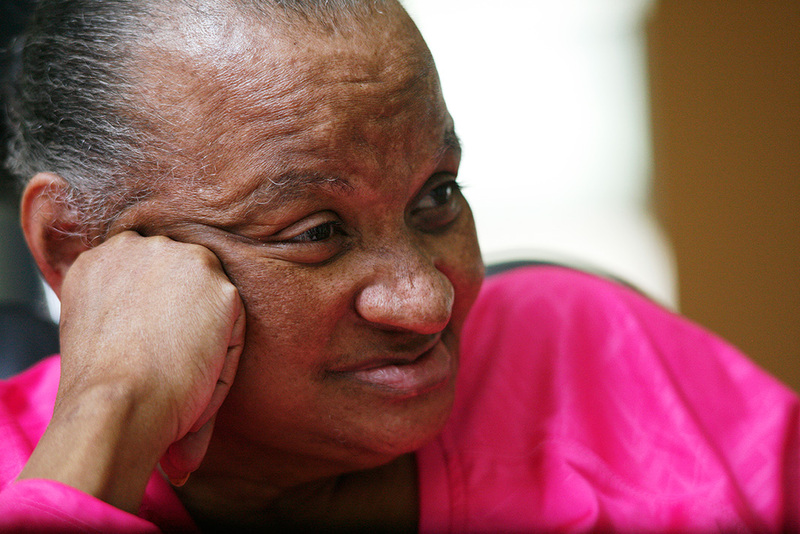 "On more than one occasion, I watched people mistake Charlene’s gentleness for lack of fortitude—at their peril." Be Be White succeeds Charlene as President. By Kathleen Sutcliffe. Updated May 22, 2018. Originally published May 11, 2016. See legal documents & case timeline. A broad coalition including Ezra Prentice Homes Tenants Association, Albany County, and several environmental and conservation organizations, represented by Earthjustice, have notified Global Companies of their intent to file a federal court lawsuit against the company for its failure to have a valid Clean Air Act permit to operate its massive crude-by-rail terminal in Albany’s South End. The coalition’s letter to Global notes that the Clean Air Act permit for the Albany facility expired on March 2, 2016. In September 2016, the New York State Department of Environmental Conservation notified Global that the company’s request to renew the permit was being denied and required Global to submit a new permit application with substantial additional information concerning the environmental and public health impacts of crude oil operations at the Albany facility. Read more. Earthjustice is representing environmental groups and Albany community members in court to challenge Global’s plan to cook tar sands oil in tankers and storage tanks near Ezra Prentice Homes, and we need your help. How many comments from the New York public were received on the final report on the potential impacts of fracking? 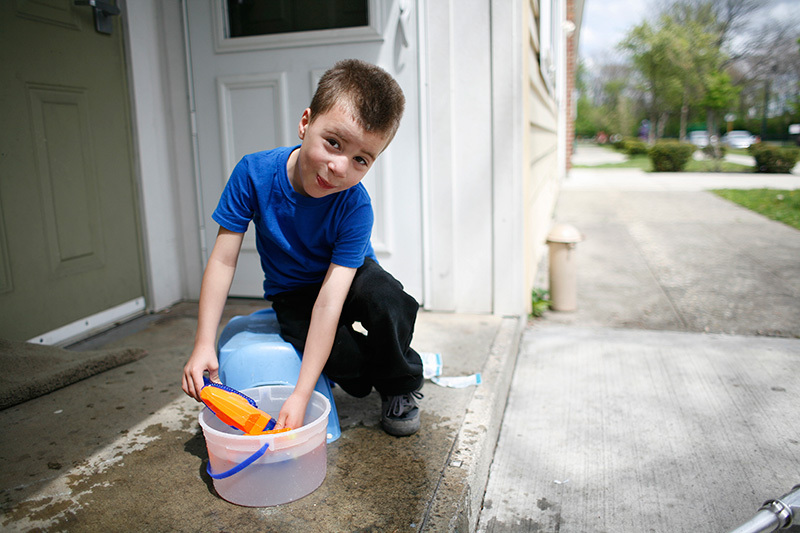 Fracking has reportedly drawn more scrutiny than any other environmental issue in New York. A final report on the potential impacts of fracking in the state drew 260,000 public comments, and 300 pages of the report were devoted to responding to those comments.